Tonight Carol and I went to the Funeral Home to pay our respects to the Johnson family. The line-up at Comstock's was a testimony to the fact that Brad Johnson had lived a good life, left a lasting legacy and had many friends who loved him and cherished his friendship. I count it a privilege to have known Brad, a godly man who quietly lived out his faith in ways that impacted many lives. His life spoke volumes. We pray that the God of all comfort will give His peace to Brad's wife Lynda and the entire Johnson family. I had the pleasure of playing Church League Slo-Pitch with Brad and his brothers Barry and Bryan. 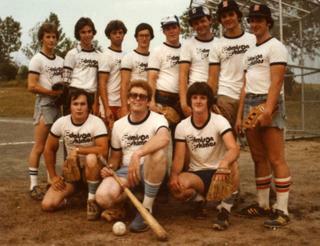 Here's a picture of the first team we played on together, the Edmison Eskimos. In the back row from right to left...Brad, Bryan and Barry. Guess who that funny looking guy in the middle of the front row is. Thanks for the memories, Brad! 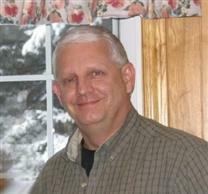 JOHNSON, Bradley Kenneth "Brad" - Quaker Oats employee (37 years). Member of Calvary Pentecostal Church. Member of Federation of Anglers & Hunters. – With his family at his side, Brad went home to be with his Lord, on Tuesday, October 19, 2010 in his 60th year. Beloved husband of Lynda (nee Jay) for 35 years. Dear father of Jennifer Capsey (husband Terry), Sarah Scheepers (husband Dean) and Rebecca James (husband Regan). Loving Poppa of Ayden, Ava, Calvin, Mary, Abigail, Mackenzie & Emily. Dear son of Kenneth & Ruth Johnson. Beloved brother of Barry (wife Cathy), Robert (wife Martha), Bryan (wife Diana) and Elizabeth Moscrop (husband Bob). Brad is loved and will be remembered by Mary and the Jay family and many other friends and neighbours. Visiting will be held at the COMSTOCK FUNERAL HOME & CREMATION CENTRE, 356 Rubidge Street, on Thursday, October 21, from 2-4 & 7-9 pm. A funeral service will be held at CALVARY PENTECOSTAL CHURCH, 1421 Lansdowne Street W., on Friday, October 22, at 11 am. Reverend Frank Patrick officiating. In lieu of flowers, in memory of Brad, donations can be made to the Ronald McDonald House - Hamilton. Online condolences may be made at www.comstockfuneralhome.com.